This fish kale red palm oil recipe is an African inspired recipe. I grew up eating this palatable meal and it was actually one of my favorite. It is often made with olive/veggie oil or red palm oil and also usually enjoyed with other veggies that might take longer to cook but I choose to make it an easier and healthier recipe by adding kale. 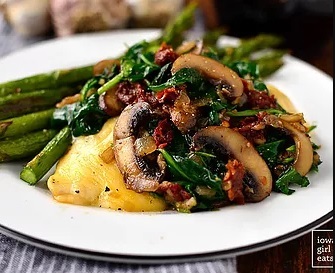 You can also add your side of favorite steam or baked veggie as we did with the asparagus. 1. Clean fish, season with tea spoon of lemon and pinch of salt. 2. Add palm oil into pot for 2 seconds and add the seasoned fish right away. Sauté fish on both sides for 4 mins at a time or until semi done. Then remove fish from the pot (on low heat). 3. Add chopped onions, chopped scallion, garlic, habanero pepper, chopped ginger, cherry tomatoes, seasoning magi cubes and pinch of salt to taste. Mix it all up and let it sauté for 10-15 minutes. 4. Add sautéed fish back in the pot, add mushrooms and kale on top and mix it slightly. Cover it half way, let it cook for 4 minutes and turn off the stove.